The Ultimate Driving Machine is combining “yuppie class” with the hipster “sharing economy” in the traditionally progressive Seattle area. BMW will offer customers of its new car-sharing service the use of 370 BMWs and Minis, with plans to expand throughout the United States. BMW is among the various automakers trying to prepare for a future where automobiles are less personal driving machines and more shared autonomous mobility platforms. While it may seem contrary to its moniker as the Ultimate Driving Machine, the German company is aggressively pursuing a future where share-riders are at the very least a sizeable and important customer demographic. ReachNow is the name of the new service, and at least for now, focuses mainly on the issues around a shared, but still very much human controlled experience. The service will offer options such as short-term or long-term rental and a delivery service. It will even offer chauffeur service. Right now it looks like the program offers the two- and four-door Mini Cooper (base only, no S, sorry), a 328xi, and the electric i3 with the gasoline range extender. It even goes both ways, allowing current BMW owners to offer their vehicles to the service fleet in order to make some extra cash, thus allowing a customer to use two different “sharing economy” strategies. The service can even be used by specifically defined groups like corporate clients or residential complexes, according to BMW. And users of the service will be able to access the cars via their smartphones, likely through a specific app. 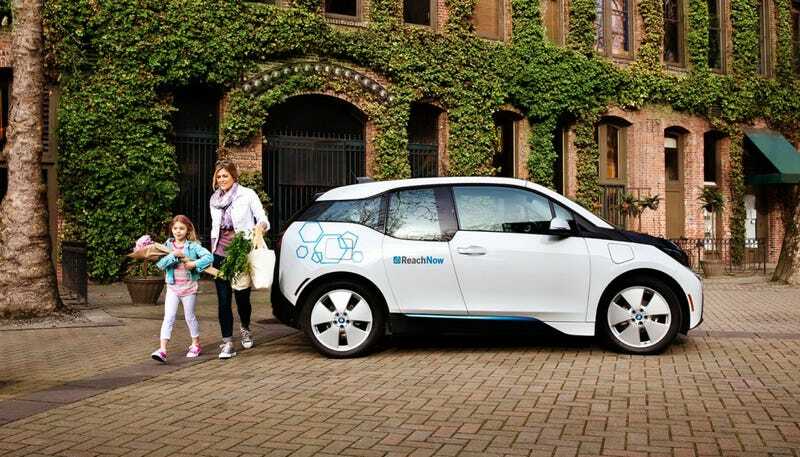 BMW launched a similar program called DriveNow in Europe which has met with success, and other car makers like Ford and General Motors are developing similar programs. Toyota offers options for renting cars through dealerships, which is something the Japanese company has been doing in its home nation, along with others such as Nissan, for years. Which BMW do you want to borrow?